"Simple and delicious! If you cook for a large family or want to reduce last-minute chaos in the kitchen, you will LOVVVVE this recipe! It has been taste-tested by adults, teenagers, children and toddlers. Everyone in my family loves it...and you will too! Can easily be made ahead; just cool, cover, and store in refrigerator overnight." Place potatoes into a large pot and cover with salted water; bring to a boil. Reduce heat to medium-low and simmer until tender, about 20 minutes. Drain. Transfer potatoes to a large bowl and mash with cream cheese and sour cream until thoroughly combined; slowly mash in chicken broth, followed by garlic powder and salt. Beat potatoes with an electric mixer on high speed until whipped, about 2 minutes. Transfer potatoes to a slow cooker. Set slow cooker to Low and cook for 3 hours. Stir melted butter into potatoes just before serving. 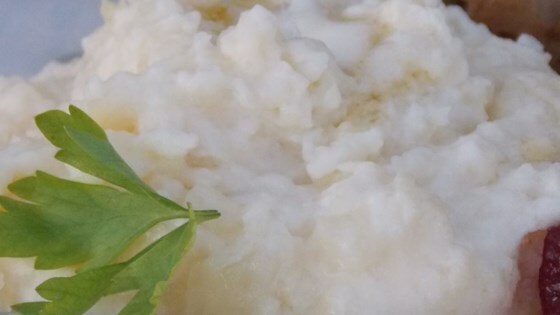 See how to make creamy mashed potatoes in the Crockpot.